Beausoleil Bridal Boutique & Tuxedos is locally owned and believes that every bride and groom want a wedding to remember. 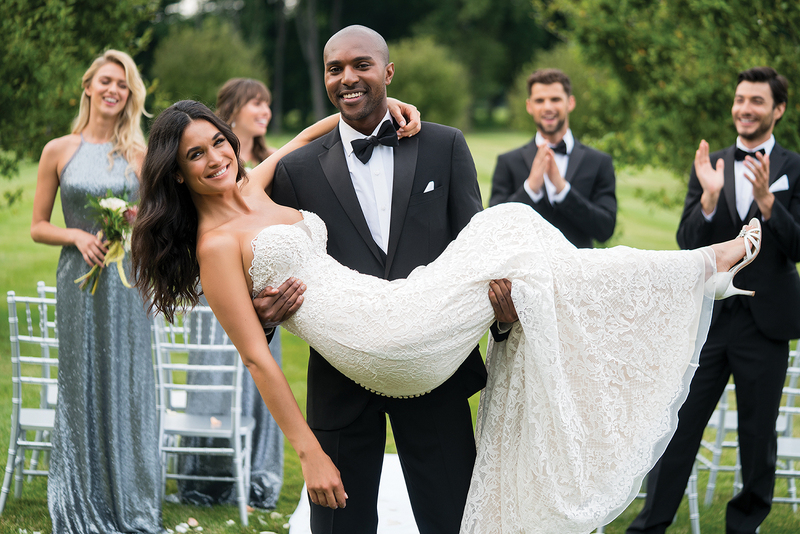 Come in and enjoy your shopping experience in our friendly, boutique atmosphere with gowns to fit every style, shape and budget along with great looks for the groom and the rest of the wedding party. 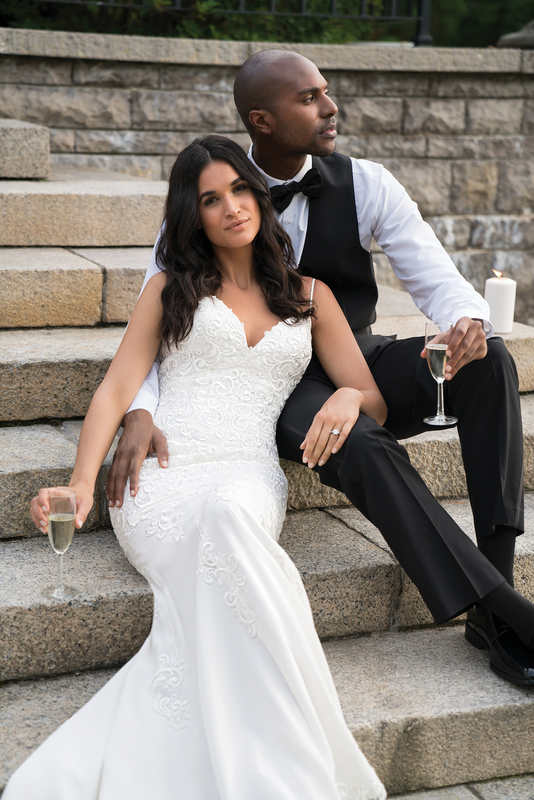 We offer individual appointments with our bridal stylists and tuxedo specialists who will help you choose from our many designers with gowns from simply elegant to beautifully elaborate. Call us today for your appointment! I had the best experience with Beausoleil! We went in as a Bridal Party and Sheryl and Brandy took such good care of us! We felt like part of the family! The selection was fantastic and there were cute styles available with shorter shipping times than other stores in the area. The team made sure that we were measured and fitted in our sizes and we had no issue with getting our dresses in in our sizes, and ready with alterations, in time for the wedding. The team was so great to work with that we sent our groomsmen there too! All around a FANTASTIC experience; definitely coming here to shop for my wedding gown. Looking for my wedding dress turned out to be a wonderful experience at Beausoleil. The friendly staff is not only helpful, but they really listen to you! After seeing a few dresses on me and seeing what I liked, my consultant picked out the dress I ended up ordering! It had absolutely everything I wanted. This boutique is a hidden gem in Eugene; it might look small, but it has a huge selection of gowns, a down to Earth staff, and really makes the wedding dress search process stress free! My daughter, Shelbie Rife, was married on September 23rd. Her wish was to use my dress, remade into her own. I wasn't very confident that it could be done and be the dress she was wishing for. Bridal Beausoleil made her dream come true. Her dress was beautifully made and exactly what she imagined for her special day! Thank you to the entire staff for taking care of every detail for the bride, groom and entire wedding party. This boutique has a 4.4 star rating currently. Don't let a couple of negative reviews deter you from using them for your special day! They care and that's what's important. Kudos to Beau Soleil boutique and thank you for all that you did to make September 23rd a perfect day for Shelbie & Chris! I had a great experience here! My stylist was Brandy and she was so sweet and super helpful! I'm plus size with a large bust so she had her work cut out for her when getting me in dresses. And she wasn't the least bit judgemental. I ended up finding my dream dress and the sample fit so well I bought it and save a bunch of money. I'll be going back for a fitting and purchasing my veil. What really blows me away is that a few days after my appointment she sent a card saying she was honored to be apart of my bridal experience. I'm sure they all do at the store but it was such a nice sentiment! Definitely wouldn't have received treatment like this at a chain store!